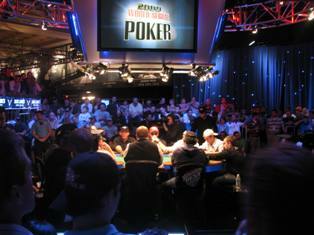 Is this the best final table in WSOP history? In 2008 Phil “OMGClayAiken” Galfond won his first World Series of Poker bracelet in a $5k PLO tournament that featured a final table many consider to be the toughest of all-time. In addition to Galfond the players battling for the $5k PLO championship included Phil Hellmuth, Daniel Negreanu, John Juanda, Kirill Gerasimov, Johnny Chan, David Benyamine, Brian ‘tsarrast’ Rast and Adam ‘houdini’ Hourani. Well, that lineup now has a challenger in terms of the toughest final nine players in WSOP history thanks to the nine players that will be battling for the $10k No Limit 2-7 Lowball title on Saturday. At the table are eight WSOP bracelet winners (everyone except for Joe Cassidy), the reigning champion of the tournament (David Baker), two former Main Event champions (Phil Hellmuth and Greg Raymer), a WSOP Europe Main Event winner (John Juanda), and a combined 21 WSOP bracelets and over $40 million in career tournament earnings. This entry was posted on Saturday, June 11th, 2011 at 9:07 am and is filed under Poker News. You can follow any responses to this entry through the RSS 2.0 feed. You can leave a response, or trackback from your own site.